It seems the first half of January has ended on a bad note for Bollywood. 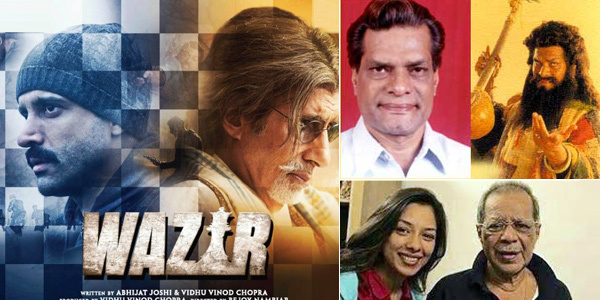 First Amitabh Bachchan and Farhan Akthar’s much anticipate film WAZIR has failed to set the box office ringing. The movie that comes from the house of Vidhu Vinod Chopra and brilliant writer Abhijat Joshi, the combination that has given hit films like 3 IDIOTS, MUNNABHAI SERIES, PK has failed to live up to the film buffs expectation. The movie has managed to collect under Rs 40 crore – a major setback for the film industry given that it was a big budget film with writer Abhijat Joshi alone charging Rs 2 crore! Besides financial loss at the box office Bollywood also lost two of its prominent veteran film personalities. On January 14, popular character actor Rajesh Vivek, recognized for his role of the astrologer Guran in Aamir Khan-starrer LAGAAN and as the postman in Shah Rukh Khan's SWADES expired in Hyderabad due to heart attack while shooting a South Indian film. He was 66. A student of National School of Drama, Rajesh Vivek came into prominence with his act as Ved Vyas on iconic TV show Mahabharata. On January 15, eminent filmmaker Anil Ganguly, famous for making family social dramas like Jaya Bachchan’s KORA KAGAZ, Rakhee’s TAPASYA, Anial Kapoor’s SAAHEB etc passed away on Friday at his residence after a brief illness. He was 82. Anil Ganguly was in the league of brilliant filmmakers like Gulzar, Basu Chatterjee, Sai Paranjape etc who were experts in dealing with the emotions of common man. Anil Ganguly’s both KORA KAGAZ and TAPASYA focused on women issue and both fetched National Awards as Best Film. Is Akshay Kumar switching to serious cinema?